He was in pretty bad shape. 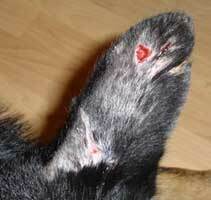 Severe swelling to the right front leg with an oozing, puss-filled wound. One ear was very hard, swollen and crusty. Emaciated and lethargic. All of his nails on all paws were ground completely down from trying to get out of the canal. He looked at me, barely able to move more than just his eyes. No excitement, no acknowledgement and when I put a lead around his neck he just laid there- couldn't move. 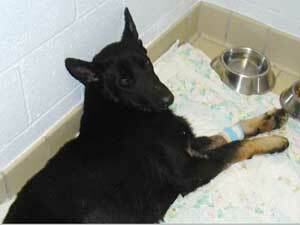 Border Patrol notes said he could not stand or walk and contacted the Humane Society. They wanted to know if rescue could help him or he would be euthanized --Ahem....NOT AN OPTION! Cyndi took Heart to her vet..he had to be carried. He weighs 65 lbs- all bones and probably 20 to 25 pounds under the weight for his structure...that's a huge amount of weight for a dog. Once in the room he basically collapsed onto his side and didn't move throughout the entire exam. No fever, heart sounded good, no congestion. Well, given his condition they're keeping him overnight. Any living creature this committed to surviving deserves the chance to live. We have requested that he stay at the hospital, on IV fluids and antibiotics and advised that we would cover the medical expenses, with which we'll need help. We cannot speak to the temperament of this dog when healthy; only that we know he's got a lotta HEART. We need to find a temporary home wherein he can recover..preferably without a lot of other animals and with someone with ample time to tend to his needs. 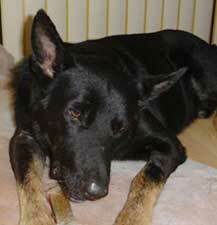 We will also do the blood work and X-rays that he will need once we get him to Phoenix. This beautiful boy is one tough cookie and is going to get the shot at life he's earned. Can you Please help us help him? UPDATE 9/29: Our boy is out of the hospital and standing..well, sort of...very wobbly, but on his feet. In fact he tried lifting his leg but fell over..he still cannot put any weight on his swollen leg. Poor guy; he must feel like he's walked across the country. Heart is now at Cyndi's home. We know his wounds will heal and he will regain his strength but he is so thin...literally all bone (hard to see on black dogs)..it's obvious he didn't get that way treading water. We're concerned about malnutrition and any underlying disease. He easily could have fallen in the canal because he was so weak, or, might have been "discarded" and thrown in..sadly, it's been known to happen. We're eager to get him to our vet, however, he's got some healing to do and medication to take before he can travel. We had originally planned on moving him to our "nursing station" in Tucson from the hospital, however, since he's in good hands for now we might just try finding a recovery home in Phoenix so that we can get his diagnostic work done. Heart still has a quite a way to go. 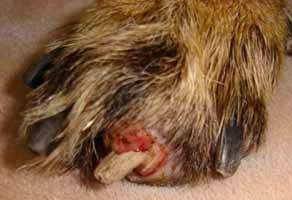 UH-OH...INFECTED PAW...BACK TO THE VET! 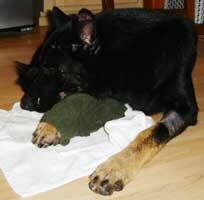 His paw is badly infected and requires soaking and hot packs three times a day. He's also on pain and anti inflammatory medication; this boy is hurtin. 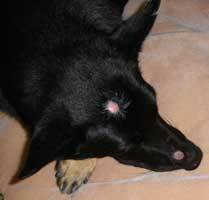 In addition, we've found some puncture wounds throughout his body, particularly on his crusty ear. 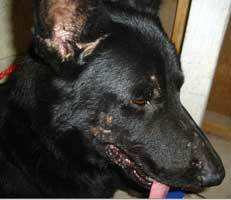 He might have been attacked, if not by another dog, by coyotes. He is scheduled to revisit the hospital on Wednesday. 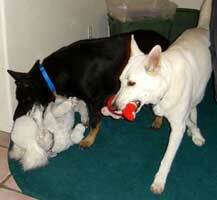 He has briefly met a male German Shepherd and a female Standard Poodle and was friendly and benign with both. Heart seems like a very sweet kid. When he's feeling better, he'll meet some cats, but not for a while. His bills are mounting...we've already paid the $300.00 for his initial hospital stay, not including meds, and we've only just begun. 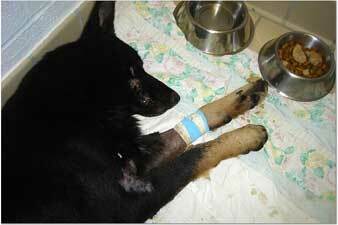 Your help is so very much appreciated and enables us to do whatever is necessary to get him back on his feet. THANK YOU!! UPDATE 10/2: Heart spent almost all of yesterday resting in Cyndi's kitchen. Obviously restless due to pain, he merely moved from spot to spot and stayed plopped down all day. He let's her do the hot pack treatments without protest but wants no part of soaking his paw; it's gotta be very painful. He will willingly allow some stuff and a stubborn "no" thanks" to others, but he IS taking all of his meds. He seems to be especially fond of men and thumps his tail when Dad gets home from work. He has also discovered the benefits of being indoors and will mournfully howl and whimper now if left outside for while. Heart can come to Phoenix as soon as a stay-at-home caretaker materializes. 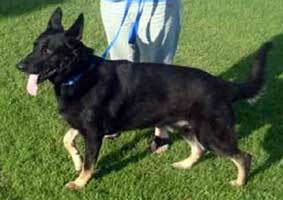 Any GSD lovin retired nurse types out there ? Several of Heart's wounds were initially overlooked until we bathed and cleaned him up, at which point several unattended flesh wounds became apparent. We really want to get him to our vet as soon as possible but we must have a safe haven for him first...the sooner the better. This wound will take quite a while to granulate over; trying to ward off infection is the primary task right now. 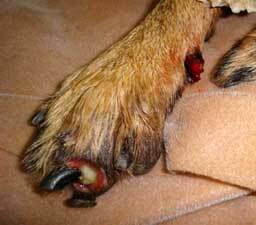 "The swelling is much improved in his leg and she was pleased with the way his paw looked. He only gained 1 lb which surprised me because he is eating at least 3 meals a day along with nutritous treats. I leave dry food out for him. I ordered the Granulex. He had a good day today--spent lots of time outside relaxing (without stressing because he was outside away from me), caught him PLAYING! with Godiva...oh and he knocked over the garbage can and spread last nights leftover beans and weenies all over the kitchen floor.....I think he's starting to feel better :) "
UPDATE 10/10: One of the punctures on Heart's ear goes through and through (to the other side) so it's going to take a while for the hole to close. 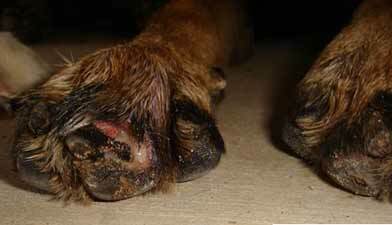 The wounds on his paws are much like treating burns; there's no skin to protect them, so every time he tries to use his paws, they bleed. 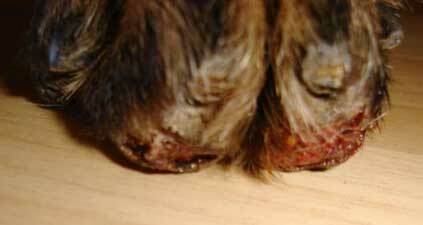 He's also losing most of what was left of his nails as well as the necrotic skin on his pads on his "good" paw. 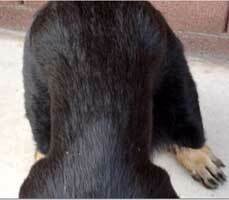 His leg above the hock is still swollen but his overall appearance and coat is much improved as his his disposition. We'll find out just how improved as he's about to meet the cats! NOW SHOWING HIS HANDSOME SIDE! 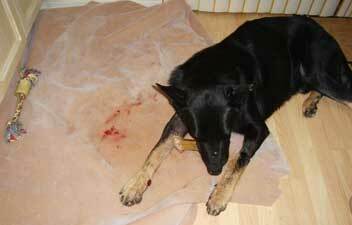 UPDATE 10/19: Heart's paw has really been bothering him and was bleeding a lot. As you can see, his live quick is totally exposed and he's about to shed his dead nail. This has to be extremely painful and sensitive. On the upside, his wound has started to granulate; a slow yet steady process of producing new skin cells where there are none. We returned to the vet today, his nail was removed and his foot is now bandaged and he's on yet another antibiotic. GOOD NEWS & BAD NEWS: The good news is that Heart is feeling good enough to play with the pack; a male GSD and female standard poodle. He even does OK with the cats, although has not been given a wide berth with them. The bad news is that his soft hearted foster Mom took in a foster kitten that managed to "share" a case of ringworm with everybody! Poor Heart and his friends will not be going anywhere for at least three weeks while they are being treated for this nasty condition! 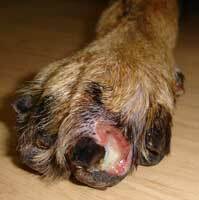 UPDATE 10/29: The ringworm lesions are getting smaller but Heart is losing the live quick on his bad paw. 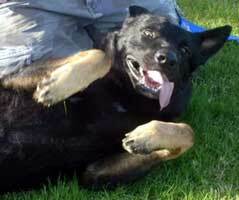 He's been described as "goofy" and uncoordinated when excited. We guess when you're front feet are on fire, it's hard to balance! We're anxious to resolve this latest development so that we can get him close to us; once all of his medical issues are addressed, he still must be neutered and vaccinated. All in good time. Meanwhile, he's a happy-go-lucky kinda guy...especially the lucky part! UPDATE 11/03:Heart's paw is slowly granulated over very nicely. The future of his "quick" --the live tissue running through the nails--is still in question. 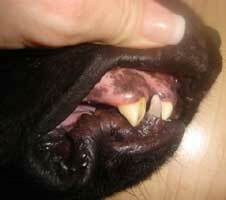 That said, it looks like some pretty hefty dental work is in his future as well. 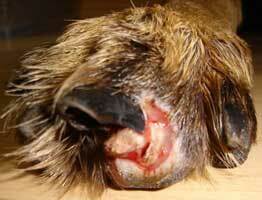 He has one broken canine, one lower dead canine and another upper canine is chipped. He apparently used the right side of his mouth pretty forcefully at some point. Not unlike with humans, the cost of dental work makes his other medical needs pale by comparison :( ...don't ya wish you knew what caused this boy's life to become so RUFF?! YIKES--2 CROWNS and A ROOT CANAL? 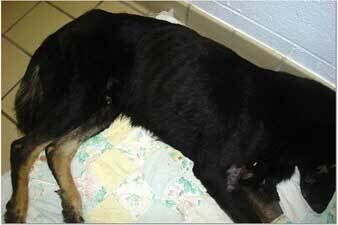 UPDATE 11/12: Remember the emaciated big blackish dog that could not even stand or walk? The one with his hip bones protruding from his rear end and ribs you could wrap your fingers around? The guy with the scarred up face and a nearly fatal case of Tick Fever? 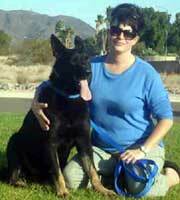 Here he is with his foster Mom..still some healing to do, still favors his right foot, yet manages to run and jump! He's actually a bit plump so we might have to put him on a diet!! Cyndi...take a bow...you're our hero! Now that Heart is stable, Cyndi's job should be done. We need to move him to Phoenix, have a specialist see what we can do about his paw and teeth and run some new blood work. We know the holidays are around the corner and would sure love to see our boy settled in for Christmas. Any of Santa's helpers out there with time for Heart? UPDATE 12/4: Assuming all goes as scheduled, Heart will be transported to Phoenix on December 16th...YAY! We know that he's a bit of a wild child, lacking in manners and training; he pulls on leash, storms doorways and is very playful & affectionate...a puppy in a big dog's body. His medical evaluation and training will begin the week he arrives..stay tuned!